Researchers demonstrate the success of a new combination vaccine in clinical trials. 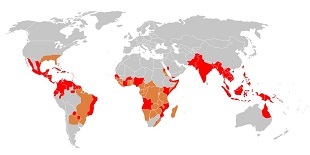 Map showing regions populated by the virus’ vector, the Aedes aegypti mosquito (red and orange), and regions with an active epidemic of dengue fever (red only).WIKIMEDIA, PERCHERIEDengue is the most common mosquito-transmitted virus in the world and, in severe infections, can cause potentially life-threatening fevers. 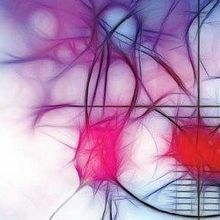 Currently, only one vaccine has been approved, but now a new, attenuated vaccine is performing well in randomized, double-blind trials, according to a study published today (March 16) in Science Translational Medicine. 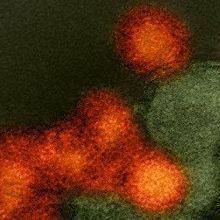 There are four serotypes of the flavivirus (DEN-1 up to DEN-4) that can cause disease. “A useful vaccine really needs to protect against all four of them at the same time,” explained Whitehead in the statement. Using recombinant DNA technology, the researchers created various candidate vaccines for each dengue type that were tested individually in clinical trials to confirm their ability to stimulate an immune response. The researchers then mixed the best-performing vaccines for each serotype into a tetravalent vaccine—“a kind of four-in-one combination, if you will,” added Whitehead. The researchers administered either this vaccine or a placebo to a group of 48 volunteers. After six months, they “challenged” those volunteers with a weakened strain of DEN-2, which causes only a mild infection, a slight rash, and a dip in white blood cell count. While all volunteers who had previously received the attenuated vaccine were protected against DEN-2, every volunteer in the placebo group became infected. Preliminary results suggest similar results with DEN-3, study coauthor Anna Durbin of John Hopkins Bloomberg School of Public Health told reporters, adding that the team planned to test safe versions of DEN-1 and DEN-4 as well. 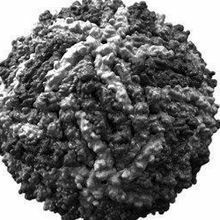 Previously, a lack of human challenge studies was “one of the things that has made the development of dengue vaccines very difficult,” Duane Gubler of the Duke-NUS Medical School in Singapore who was not involved in the work told Nature. 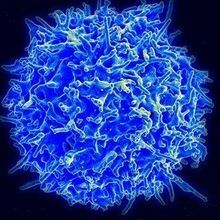 The vaccine is now being tested in Phase 3 trials with much larger numbers of participants, Durbin told reporters, adding that the experience gained in the development of this human challenge model may also potentially be translatable into models for other flaviviruses, such as Zika.